Sash windows are a stylish and environmentally-friendly investment. These may be structures that were already part of your property when you purchased it, or they could be recent additions that you’ve made to improve upon the aesthetic beauty and all-around marketability of your abode. Irrespective of why you own them, it is important to diligently maintain your sashes and to make sure that they are absolutely draught-proof. 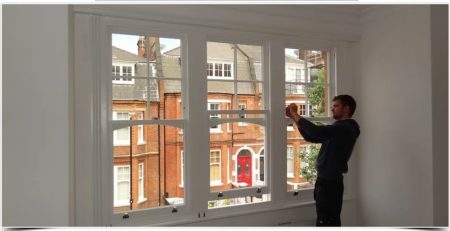 Following are a few of the top reasons why you should invest in the services for sash window draught proofing London residents have access to. To start, this is the surest way to enhance the overall efficiency of sashes. It is vital to note that this particular type of window design is highly efficient in and of itself. This is largely due to the fact that wood, as a very poor conductor of heat, happens to be naturally self-insulating. Moreover, homeowners have the ability to create a strong, cross breeze that effectively cools their living environments during the summer months by simply cracking these structures. Their unique design allows for optimum air flow. When they are draught proofed, however, sashes provide an even higher level of efficiency. They serve as the perfect barriers against cold drafts outside during the winter months. Throughout the summer, if you happen to use any mechanized cooling system, these units will also ensure that the conditioned air remains inside of the abode, rather than seeping in. This method of window enhancement is about far more than merely adding on a bit of weatherstripping. It is instead, a complex arrangement of built-in barriers that are meant to block not only air, but also dust and other particulates. As such, your new and improved windows will also be more secure. Homeowners should understand that sashes, despite having been around for centuries, remain some of the securest window options on the market. This is because they can be securely locked, even when they are in a slightly opened positions. Complete drought proofing only adds to this security. Upgrades or enhancements such as this one are guaranteed to add both value and appeal to your house. Should you ever choose to place your home on the market, prospective buyers will love the look and all-around stylishness of these features. They will also appreciate the fact that you’ve taken an extra step to improve upon their overall efficiency. Moreover, you can increase your sales price to reflect this addition. If you consider yourself to be environmentally-conscious, then lowering your carbon footprint is probably one of your primary goals when enhancing your home. Making every effort to minimize drafts is one of the best ways to do this. When you do, you won’t have to rely upon your central heating and cooling system as heavily, even when the outside temperatures plummet or soar. As a result, you can greatly decrease overall energy use for your entire household. Beyond lowering your energy consumption, this is an improvement that can additionally lower your energy bills. You will obviously pay far less in utilities when you rely on your HVAC system a lot less. As such, there are actually multiple ways in which draft proofing sashes is a home improvement project that will invariably pay for itself. A number of London properties that have sashes are considered to be historic buildings. These are homes that are built in dated architectural styles and that have been modified very little since their initial constructions. With these houses, there is limited ability to incorporate modern heating and cooling systems. Without conventional duct-work, centralized systems simply aren’t possible. In these cases, having efficient windows is vital for maintaining a comfortable abode. Sashes can be very effective at creating ambient temperatures indoors, year-round. This is only true, however, if they are both properly maintained, and draught proofed. Finally, this is a measure that can actually help limit noise pollution. If your neighborhood is becoming an increasingly busy one, you have probably grown tired of outside noises diminishing your ability to relax or engage in quiet, solitary activities. Once these systems have been installed, outside noises will be muted significantly. Given their ability to block dust and other particulates from entering the home, these systems can even increase your overall indoor air quality.